The Luang Prabang morning market is a wonderful place to find interesting and authentic food. Among the mountains of fresh locally grown vegetables, there are also an abundance of snacks for breakfast. In this article I am going to give you the details on what to do and what to eat. Read on to learn more for your next visit to the the morning market in Luang Prabang, Laos. Also check out my full Luang Prabang travel guide. Luang Prabang might be a World Heritage City, but I would vote for it as a UNESCO Food Heritage City as well. There are just so many interesting foods to try, and you’ll find so many at the morning market. Wonderful breakfast snacks, relaxed and friendly vendors, and miniature mountains of jungle vegetables overflow fresh produce tables. Another great thing about the morning market is that it’s located right in the heart of old Luang Prabang, on the lanes surrounding Wat Mai, just off Sisavangvong Road. Many of the hotels and guest houses in Luang Prabang are also in this area. Its likely the market will be walking distance from where you stay as well (I really liked staying at Apple Guesthouse). Far from the hectic market pace you might see in a bigger market like those in Vientiane, the Luang Prabang morning market is relaxed and moves at a slow pace – just like most things in the city. Be on the lookout for the more rare items here like locally grown spices, forest-collected mushrooms, and other medicinal home remedies. 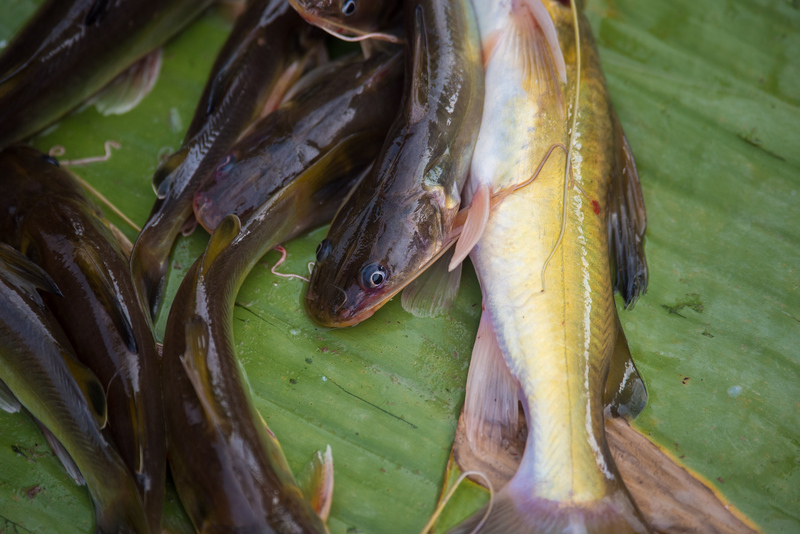 Fresh MeKong catch – freshwater fish here are plentiful. In Northern Laos, this town is a district capital, but Luang Prabang is also the largest town in this entire region. People wake up early to travel from surrounding villages, come to buy and sell food and produce in the larger markets here. One thing you will notice immediately is how there are both common everyday vegetables sitting directly next to wildly unique jungle ingredients. I was surprised by a few things I didn’t even know were items of food. This situation creates the perfect atmosphere for a hungry and curious food traveler like yourself. Honeycomb, with bee larvae inside, straight from the grill. The vendors start setting up before the sunrise, and it was already very busy when I walked up at about 7 AM. 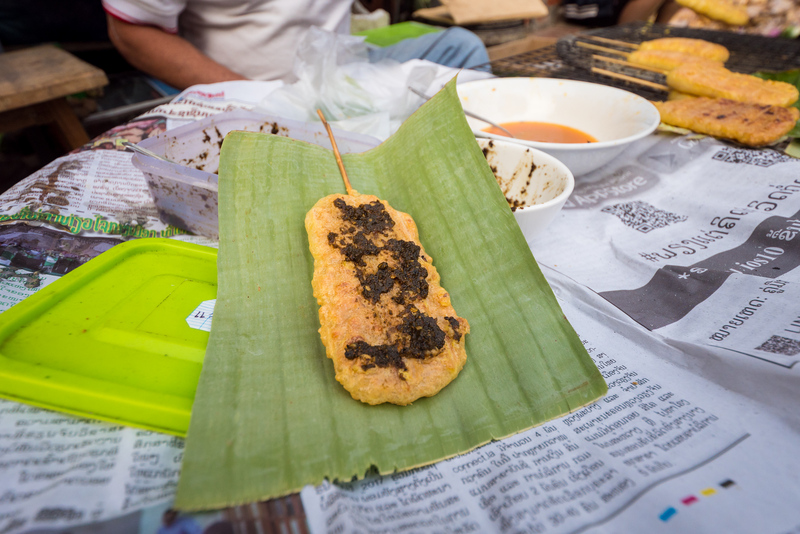 Not ten steps from the entrance, I’d already spotted something new; Charcoal-grilled chunks of honeycomb, full of bee larvae, each one wrapped in a banana leaf. I excitedly crouched down in front of a single grill tray, and the vendor cracked a smile. Guessing that this was a special item, I saw that even a few local shoppers were looking on with interest and buying it up quickly. Prying open a banana leaf packet with one hand, I quickly counted out some small bills with the other. A wonderfully smoky aroma escaped, with just a hint of moisture as well. Biting into it, there were so many different flavors going on that it took my brain a few seconds to catch up. A slightly crispy exterior layer following just the slightest bit of sweetness – but the larvae were what really made this bite special. Yes, larvae, bursting with flavor, each a little packet of moisture. There must have been a hundred individually structured, slightly waxy pods in each banana pouch. The banana leaves protect the moist larvae inside, while also being an earth-friendly package. I was absolutely delighted by the massive juice-explosion of taste bursting from this all-natural treat. 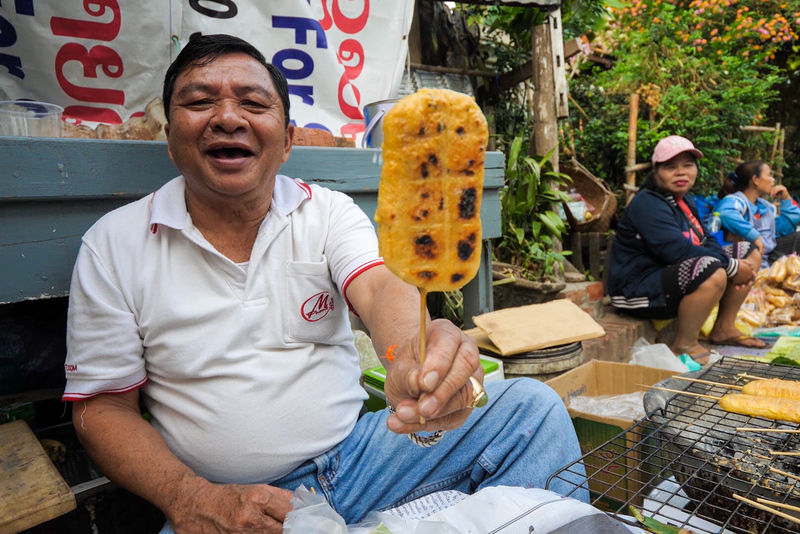 You don’t have to go searching through any forest canopy to find this – for just 5,000 Kip, you can enjoy a honeycomb and even watched them being grilled, right here in the morning market in Luang Prabang. 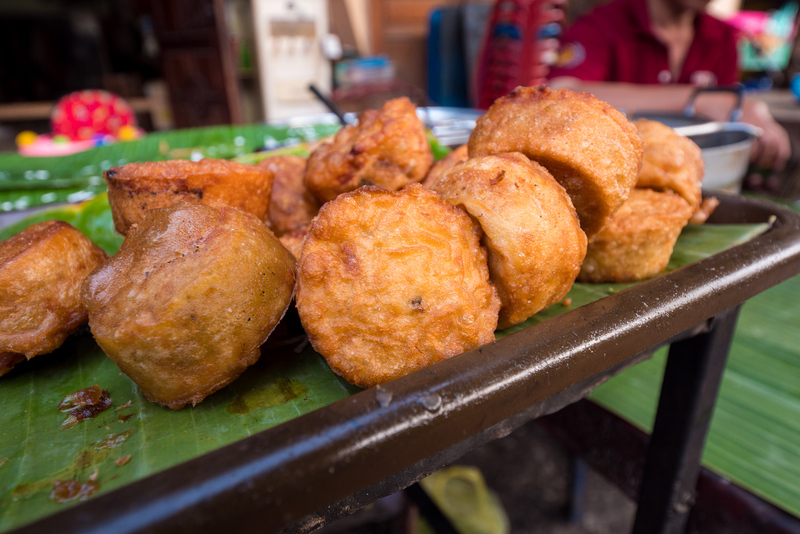 Another dish that might seduce you at the morning market in Luang Prabang are these deep-fried mung bean coconut rice-cakes. The chef ladles up some mashed beans and coats them with batter. Drizzling on a mixture of coconut milk and sticky rice flour is what gives these their sweet taste. He dunks the combo into a pot of hot oil, smiles at the excited and hungry customer, and after about 20 seconds scoops the fritter into a serving dish piping hot. Eat them immediately, always the best way to enjoy a morning treat like this, but don’t burn your mouth! The beans were so warming, so soothing to a hungry stomach in the cool Luang Prabang morning market air. It’s a heartiness of fresh mung-beans, crunchy from fried flour on the outside, with a warm, soft interior. 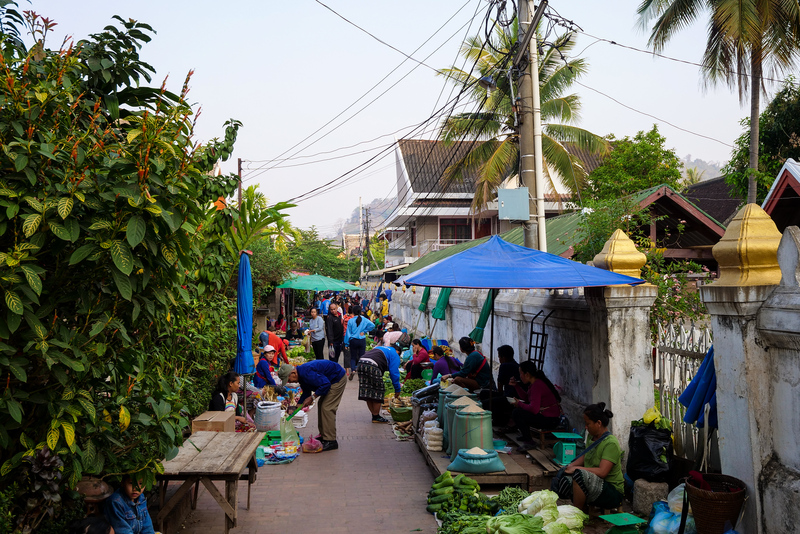 The Luang Prabang morning market is mainly along one long street, with an alley splitting off about halfway down. Near the T-Junction, immediately be on the lookout for a super-friendly Laos lady selling pieces of her home made meat cakes. 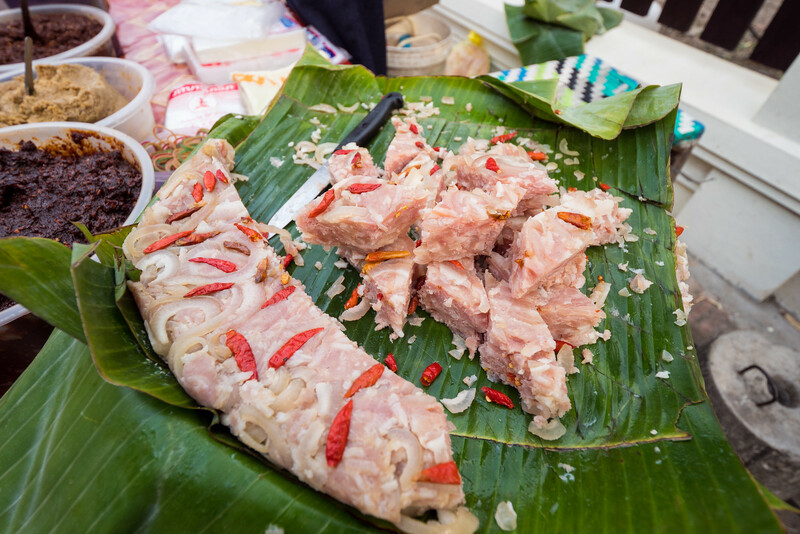 Naem is always made with pork, and it is sun-cured before being steamed in banana leaves. Commonly made as a mixed salad to have with rice, this is a different version – a slimy, porky, garlicky slice of meat pie. You can see pork skin, glistening fat, large chunks of chewy pork collagen, and of course several fresh red chilis added on top. Maybe not the most appetizing dish at first glance, but I was blown away at how many textures were brought together in a single bite. 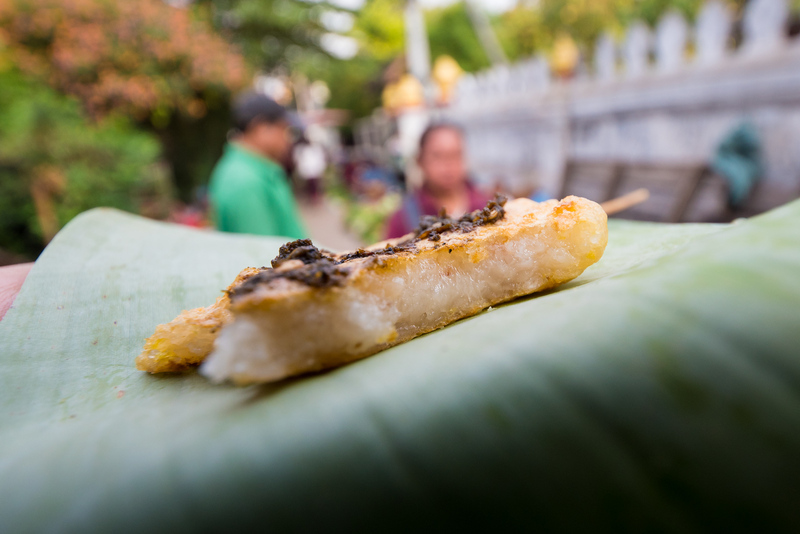 So many vendors serving up examples of the ingenuity present in Laos cuisine – like this Naem cake found here, they should be commended on how they use just about every single part of the animal. 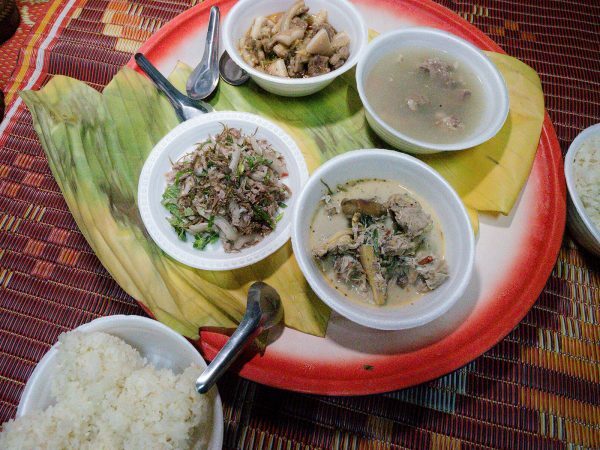 There are also plenty of dishes in Laos cuisine that are similar to Vietnamese dishes as well. These hand-rolled noodles are made to order, the fresh ingredients combined with the cook’s own seasoned combo of minced meat, onions, and herbs. The standard pork noodle wraps are so tasty that we couldn’t leave before finishing three whole plates. She does have though, several other versions on a menu behind her serving table. Each bite was a perfectly balanced combination of chives, green onions, garlic, and cilantro. She covers them all so gently with thinly stretched-thin- steamed rolled noodles. Watching her hand-make each noodle is just fun on its own, the seating arrangement so close and personal. There is almost no space to move at all, and yet its still so incredible friendly. Khao Piak Sen – Noodles in a thick soup broth and a delicious assortment of pork parts. Among all the walking stalls at the morning market, there are also a few places where you can sit down for a bowl of noodles. Khao Piak Sen is very different than the more famous Khao Soi. It uses different noodles and broth, and the entire chunks of meat it contains. 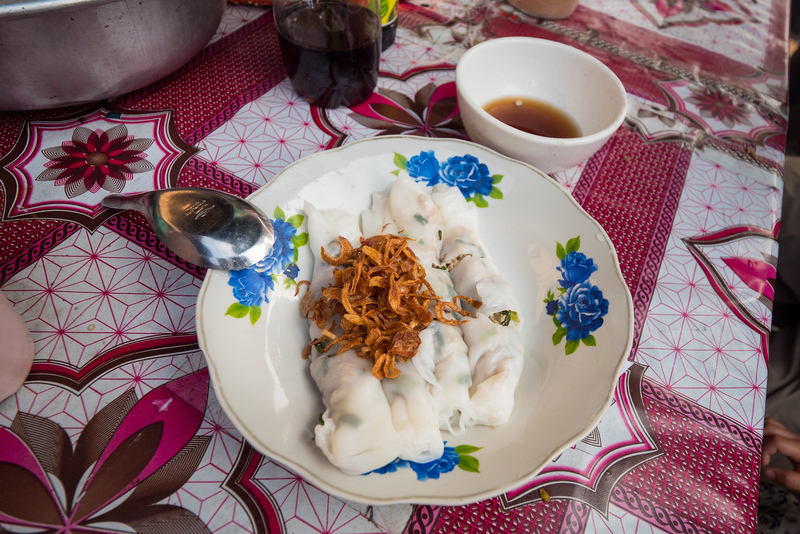 This dish is totally a Laos comfort food, great for warming up any morning. These crushed red pepper flakes fried in oil are an ever-present treat! 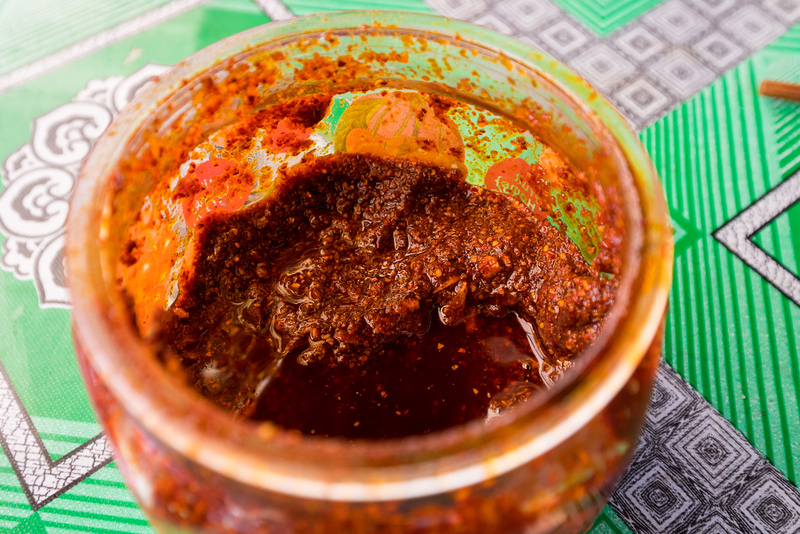 Adding a heaping spoonful of chili will light this dish up just right, and also be sure to throw in some herbs, and squeeze in the juice of a lime. The broth really is so good that its tough to not order a second bowl. Directly in front of me was a man selling his own recipe of Khao Jee (grilled sticky rice). I think he embodies this ‘encounter’ perfectly. Walking up, he was calling out a price of “5,000 Kip per stick,” loudly, while showing a large smile. When he noticed us, walking as a family, his smile grew even bigger. His next words were (in great English), “5,000 for two, they’re great!” Not done yet, because are stopping in front of his grill (which I learned was also the front of his home) he motions as if to say that they tasted even better when sitting down right next to him. The final offer came to be a ‘buy 2 get 1 free’ of sticky rice egg treats. He was just so friendly. We sat with him, literally behind his grill, and just munched while he told us stories about life. He even enjoyed a stick with us, lathering on his own recipe of mashed chili paste. Thick with Laos PaDaek fish sauce, smelling so wonderfully strong I’m sure some fellow market-sellers were getting jealous. Times like these brief experiences are so representative of the heart-warming welcome you receive when traveling in Laos. It assures I’ll always have fond memories from any time lucky enough to spend visiting this beautiful place. The morning market is one of the best places to visit in the city, and should be included in your Luang Prabang itinerary. I went just about every morning I was there, and discovered new things everyday. The vibrantly colorful ingredients, the friendly people, and the delicious pre-cooked snacks, all contribute to its charm. 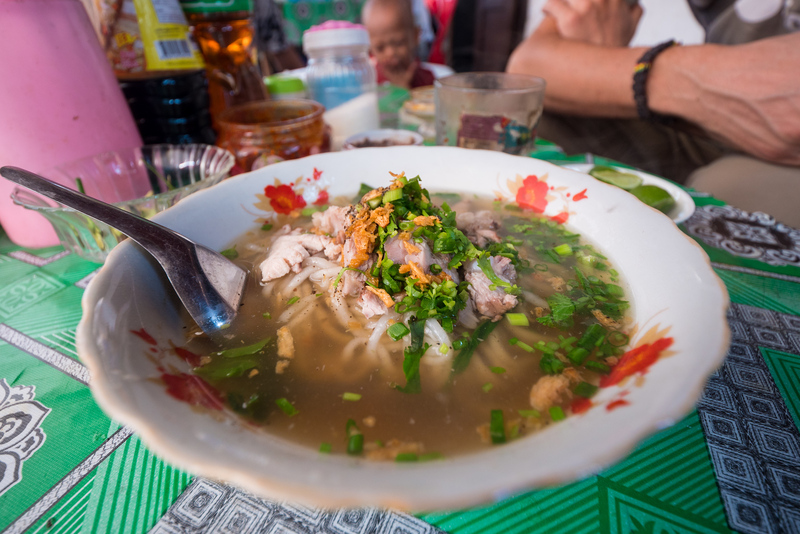 Thank you for reading this guide to the morning market in Luang Prabang, and enjoy the food! 169 comments. I'd love to hear from you! Great Article. Love the way of presentation. Santosh! Thanks for your support, and your kind words. Take care! This is Great! Good Going! Hi Dexter, thanks for the kind words! Great post. I will try these foods for sure. Thanks for sharing. Youre welcome Jim, thanks for the support! Erica, thanks so much! Yes, it was a journey for all senses for sure! Have a great day, thanks for the support. Hello, there , you just made up my tomorrowmorning plan in luang prabang ! After 3 fun days of chalenge on a katu backstrap weavingtool ( unique technique with beads from the south ) i sure need some walking to confort my back and legs 🙂 as you say …warm welcome everywhere ! Morning Market looks awesome. Thanks for the information, Bruner. I would love to visit when I have time. I started watching your videos with my kids and you were killing me because I was on an extended water fast. We’ve enjoyed the videos very much and I really like the style you do it in please don’t change. Look what happened to Anthony Bourdain, keep your focus on good food and let us enjoy them with you. Morning market looks amazing in laos. I think I should go there in my next Laos trip. Thanks for giving idea. Thanks for article. Well organized. You’re welcome Kalpesh, thank you for reading and for your support! I love your article very much. You covered the topic morning market very nicely. Thank you for sharing this. You are very welcome Arup, I hope you have a chance to visit this amazing place as well! Those foods look interesting and different. I would be interested in trying some of them. Amazing food. It looks so tempting! I enjoyed reading your blog which is stuffed with great information for readers like us. Thank you very much Christmas Wishes! Thanks so much Tara! Happy to help with any growing food obsession 🙂 Have a great day! Thats wonderful Minna, thank you for your support! You did a great work putting these togheter. 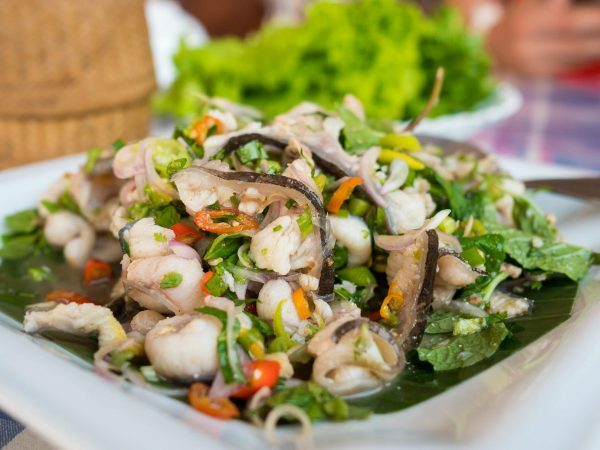 Your tips on Laotian food are just amazing! Just read them all, one month before my trip to Laos. I’m very inspired by your work! Congrats!! Tripping Unicorn, thank you so much. 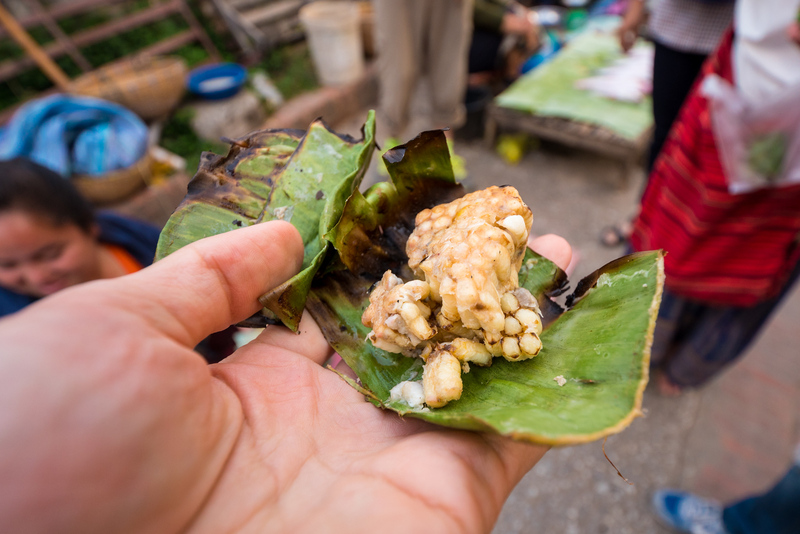 I hope you have a wonderful time in Laos, what food was the most impressive to you this time? Amazing information!! It looks so yummy. Thanks, I just about to be there again this Winter. It is a very relaxing place away from crazy BKK. Love the people and the environment. But however many Thai looked down Laos because of a poor country. Thanks for the hard work. Thanks for writing Jim, yes I have found some of the most rewarding experiences in my entire life to be had among the ‘poor countries’ of this world. Always worth the trip 🙂 . Have a great day! Thanks for writing. This looks like such an awesome experience. The way you described that honeycomb had me wanting one! Loving your blog and photos! Will certainly keep these tips to my trip to Laos soon. Thanks again ! That’s so beautiful! Just amazing! Excellent Foods. Very interesting to read. I really love to read such a nice article because it is very informative and useful in daily life. Thanks for sharing. Thanks for sharing the amazing food. i like it. Thank you for reading Rambharat, have a great day! Very different from these meals, I was curious as to what they should have, it is very different from everything I have seen and eaten. Cda local has its peculiarities in terms of cuisine, very enriching this post. Loved it. wow your article is very nice. the pictures is very good . after seeing this i am very hungry. thanks for give us this good foods details ………..
its seems, this is 70% fish market and rest are vegis only. I would go once there for local shopping, quite not interesting but still planning to go for vacation. Hope this article really help me to find the more better place. Thanks for sharing. Thanks for writing Jina, I hope its helpful! The food sounds delicious! Great post! Oh, great, the food here is very good and attractive, thank you for sharing. Nice article and some wonderful tips for travel. It is very helpful for people who start travelling first time. Street Foods are so yummy. All these pics are really Amazing, Morning markets,noodles,fresh fishes. Awesome Post ! Thanks for sharing this Mark! your story and informaton is so amazing. i always enoy your artical. Such a amazing story of travel and great review you shared. Food look awesome. Thank you so much for sharing this post! Great work. blog (I likewise love the subject/plan), I don’t have room schedule-wise to peruse everything at the moment, however, I have bookmarked it and furthermore included your RSS channels, so when I have time I will be back to peruse all the more, Please do keep up the magnificent activity. It is one of the more fun morning markets because of the variety, thanks for writing Michael! Have a great day. Nice snaps, Would love to visit this place, thanks for sharing this post. Great Post. Explained Very well.. I am very intersting on your video and I am from SAI GON-VIETNAM.My Restaurant and Pub is in downtown near by BEN THANH MARKET-I really would like you to check-in us on with your video comments:). Email me with your schedule when you have chance to visit Viet Nam again,. Thanks very much Le Dinh Bao, I would love to visit Vietnam again, especially Saigon! Great place,Great food. Will make my trip plan to Laos soon..!! Your story about travelling and review many of food is so amazing. Especially in Lombok (ayam Taliwang) ! Thank you for visiting Lombok, Mark. I would love to visit this place and taste all the food which you mentioned in your post. Thank you so much for sharing this post!! I would like to have a morning walk in this city. It looks really very nice and amazing. I would love to eat various food items as I find myself, foodie. Omg, love the pictures! I was there around 3 years ago and loved it! Can’t wait to go back! I do love a visit to a local market for a taste of home grown food. Not so sure about the honeycomb with bee lava though! HI! it’s very awesome article and clear guide. ALso looks very yummy food. Hi Mark. We are planning to visit Luang Prabang very soon and will be using this post as our food inspiration. Thanks for the great posts. Outstanding content Mark. I always follow your videos on Youtube and I would love to visit the places you have been to. This is awesome. It feels more like a tourist market. Even without being there physically, I feel like I’m there, I could perceive the aroma from those inviting snacks, the fresh foods available and of course the vendors all look friendly. I love this. I would certainly visit whenever I find myself close by. You’re doing a great job.I can learn a lot.thanks for this post. We visited Luang Prabang on our first trip to SE Asia about 12 years ago, and simply loved it! We returned in 2009. I felt it was starting to get over touristed. But, I am glad to see the market remains traditional, and for the locals! Thanks for sharing this Mark! Luang Prabang is one of my fav places in SE Asia! Your post brought me back memories of that amazing city. Thank you! I miss real, fresh food like this (haven’t actually been to Laos but have been to Vietnam!). Must have been so lovely and chill to just sit with that guy and eat the grilled sticky rice. It looks good as well! One of the thinks we loved about Asia was the street food. This markets are both amazing because of the strange (for us) things we found and delicius… because we had to try a lot of things! Good travel tips, Bangkok has the best food in the world by a long shot in my opinion. Awesome Yliac, yes I am lucky to live there! What a delicious post! The food looks so yummy.. We are planning to visit Laos. Thank you so much for sharing this post! This place looks amazing! I’m not a morning person but I would gladly wake up early to get to experience it. Its well worth it Barbara! Thanks for writing. Funny, this is the 2nd time in 2 days I’ve heard about Luang Prabang! One of my favourite things to do is to explore the local market when I’m travelling to a new place. I learn heaps about the local culture and their food. I love street food… Thanks for great post. Nice article. This was really helpful post, Thanks for sharing with us. Street food looks yummy in the Asia! I did not know about it before becoming an addict to your blog! Thank you for the great posts. its amazing! the images showing that i could have those tasty meal… Its very great to go in market early morning to shop for home.. Thanks for the nice blog post. Wow – I had no idea that Lao food was so diverse. I really look forward to visiting Laos one day and exploring all those different options. The honeycomb with bee larvae looked especially intriguing. Thanks for a great read! So glad to find your post. We are visiting Laos next month and were looking out for some good markets with some good food. Will be sure to visit this one! I’m intrigued by the grilled honeycomb but not entirely convinced yet. lol The rice cakes look delicious though! keep sharing such beautiful blogs. I will definitely visit Laos. Keep Sharing! I’ve never heard of charcoal-grilled honeycomb with bee larvae before! I’m not sure I’m game enough to try it, but you made it sound devine. What an incredible experience and I’d love to visit Laos one day soon. I love visiting local markets of a place. Luang Prabang morning market looks so interesting. Looks like there’s a lot of seafood items on sale there. 🙂 I’d love to explore it. mountains of fresh locally grown vegetables, and an abundance of snacks for breakfast. So delicious post! You shared literally yummy food in your post. This looks so beautiful. Really want to go there and taste all the dishes which you shared in this post! Thank you.. Such a awesome post! The food look so delicious in your post. Always loved your post.. I really want to taste it. Thank you so much for sharing a great experiences. I love traveling to Asian countries especially because of the food. 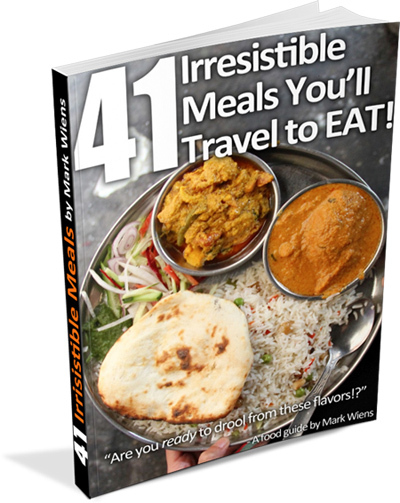 I once read an article that one of the survival tips for eating while traveling in Delhi is to avoid the big restaurants because they tend to keep food over night in fridges which may not work with power black outs. So, one is better off going to the locals/street vendor where you can see them making the produce in front of you. Well, each place may do things differently, but from my experience I think Asian food is wonderful in this way because most things are cooked to be eaten within just a few hours. Almost everything you get from either markets or small restaurants is probably quite fresh! This market sounds heavenly. Small markets with lots of locals are the best kind. It’s often where I buy my herbs and spices to take home. Wow! It look so delicious in your post! Awesome food you shared. Really want to go and taste all the food which you mentioned with us. Thank you so much for sharing a nice experience. Hello, i just love your site. To give a healthy start to a day, this place is perfect. I would like to meander in this market. Thanks for giving us an imaginary tour of it. Amazing Photos, Really so excited about this market. Thanks for sharing it with us. This market looks trully amazing. Khao Piak Sen – completely amazing. Loving all the photos, I really must return! Amazing, thanks for sharing it! All of this looks so amazing! Really nice stuff! I’ll go check the price of a ticket to there now! Haha! The food looks fresh so does the morning atmosphere. Everything is great during mornings and the story of the day begins. When I read about the combs, I thought, “I don’t care if I’ve tried other foods, I’d rather eat them than this, there’s nothing I can show you now that makes me salivate like this,” and then you go and put the fried beans in… I’m starving!! Haha thats awesome Divani, thanks for sharing! I love Vietnamese food. good to know Lao is similar. Can’t wait to try. yammi! Food seems too tasty even last year i went there with my wife and stayed for 3 night. very interesting place and peoples. Once more i want to go. Thanks for sharing your experience. 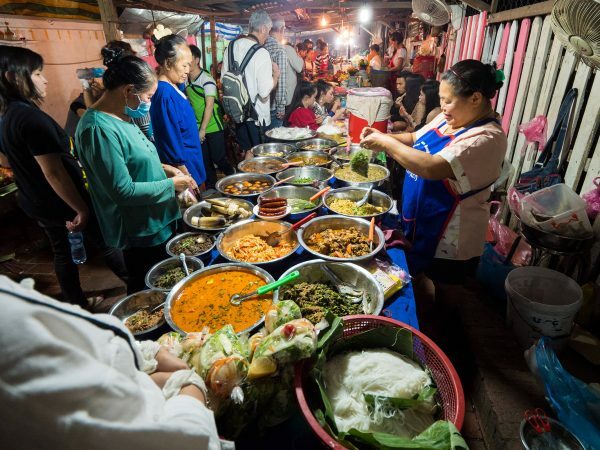 Have you been to the night market while in Luang Prabang ? It is a very nice handcraft market we loved when we were visiting the city. The food looks very delicious, am a vegetarian and i love this. Thanks for sharing. Is it safe to eat to food when you first arrive their ? The food looks so yummy, perfect for a foodie like me… ???? Nothing beats an experience with a local person like that. Those are the memories that stick forever. And wow what a breakfast. So curious about the bee larva but not sure I would have the guts lol. Amazing Post with Delicious foods. Fulfilled with attractive pictures and information.Thanks for sharing. Oh my goodness, those morning noodles look so rich and tasty! I love a good food market – all those colours, smells and sizzling sounds. We count our stay in Luang Prabang as one of the fondest memories of our time in SE Asia. The markets are wonderful and your post brought it all back. I would never have imagined that bee larvae in honeycomb would be so appetizing! Wow! Your photos are truly drool-worthy – thanks for sharing! OMG! All of these make me want to to go back to Laos. Honestly, I think it has the best food in SE Asia. The green curries were even better than Thailand! Its actually look yummy ! Those small fresh fish look so good. 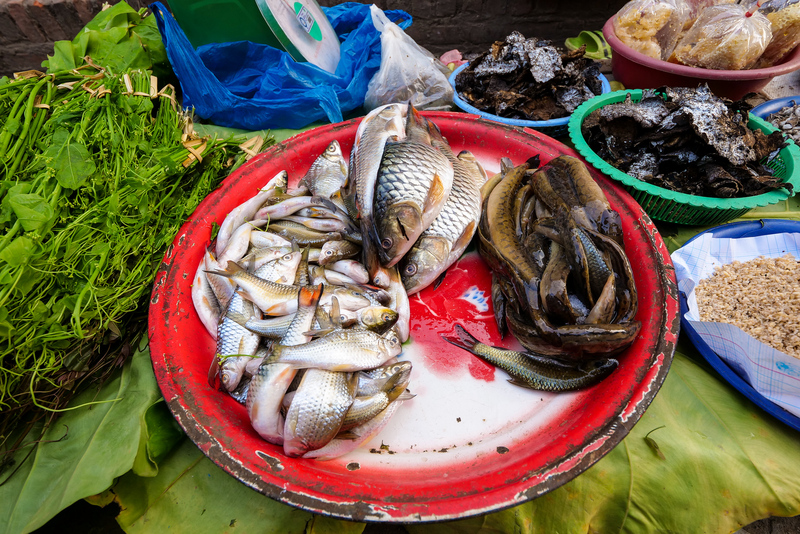 Smaller fish are supposed to be more nutritious too. Would also love to try those morning comfort noodles. My wife and my daughter started watching your Youtube videos now too on our new Smart TV. The food look awesome. I came across the morning market by chance when I was in Luang Prabang. I was up early as I had left my phone on a longboat and the amazing driver arranged to meet me early in the morning to collect it. So I was on my own making my way down to the river and came across this market. Unfortunately I didn’t have as much time to browse as you did, but I loved getting a glimpse into the morning ritual, and it’s great to see your more in-depth account of it here. Just watched your two part videos trip to Luang Prabang. I saw you ate some blood dishes and was wondering if it was safe to eat blood live that? I remember on my trip to both Vientiane and Luang Prabang back in 2012 my friend and I agreed that Lao food was so good we couldn’t understand why it was overlooked by the culinary scenes of its neighbors. 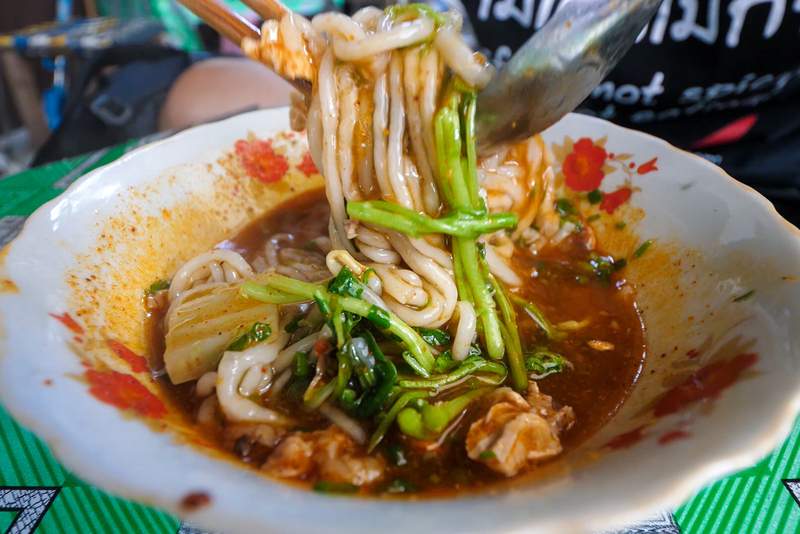 The trip was too short to try all the dishes you mentioned in this post, but we know we will return to Laos one day — not only for the food, but also to meet those friendly people again. Hey Bama, great to hear from you. I fully agree, such incredible food, peaceful culture, and friendly people. An amazing region of Southeast Asia.